Eads board members began the process of approving documents for the upcoming water system improvement project. Heritage Farms announced future plans at a gathering of area residents and government officials. USDA Update-Rod Johnson: Computer delays seem to be the normal in FSA with the implementation of the new farm bill. Wes Eikner, 8th grade student at Eads Elementary, won a Bronco T-shirt in a Bronco Mathmania contest sponsored by the Pueblo Chieftain. Areta Blooding Laird was honored at a reception honoring her retirement from the US Naval Reserves with a plaque and letter of appreciation for her 25 years of service. Southeast Colorado Power Association is planning to open an office in Eads, which may be shared by Peoples Natural Gas and Eastern Slope Rural Telephone Association. The Eads board of trustees tentatively approved an ordinance annexing a little more than 21 acres immediately north of existing town limits. Realized net income for Colorado farmers and ranchers was down $307.1 million during 1976 according to the Colorado Crop and Livestock Reporting Service. Towner News- Marjorie Osborn: Weekend was rough on the young people of Towner. Tom Scott broke his elbow and Travis Barns broke his collar bone. 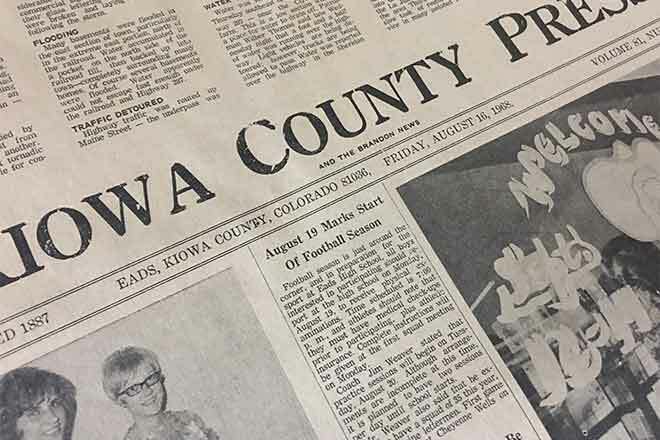 About 15 interested people agreed to organized the Kiowa County Historical Society. Remodeling of an office building on Maine Street has been completed for a dental office and Dr. John Hines D.D.S. has moved equipment in and hopes to open soon. Many peace officers from Colorado, Wyoming and Kansas were in attendance at a meeting held in Eads. The afternoon session was featured by a pistol shoot. When a prairie fire was reported east of Galatea, the whole group rushed out there and help get it under control. J.M. Infield completed a transaction whereby he sold his 3 big elevators in Kiowa County to the Farmers Union. Will Ballard, who recently purchased the Gerald Spurgeon farm in the Fine Flats neighborhood has moved with his family from Peabody, Kansas. He shipped in a car of farm machinery, some good mules and is here to stay. We are informed that on or before November 1, 1917, two oil rigs will be placed upon different tracts and embraced the holdings of the Rush Creek Oil Company and the test for oil-bearing sands will begin.